Silver mica capacitors have been widely used as high-performance capacitors over the years. Mica is a group of natural minerals. Silver mica capacitors are capacitors which use mica as the dielectric. These are high precision, stable and reliable capacitors. They are available in small values and are mostly used at high frequencies and in cases where low losses (high Q) and low capacitor change over the time is desired. The mica dielectric obviously forms the basis for silver mica capacitors. Its properties govern the performance of the silver mica capacitor. It was also one of the first dielectric materials to be used for capacitors in the early days or wireless because of its combination of stability and general physical and mechanical attributes. Although there are several different forms of mica, they all have very similar properties. They are fundamentally very stable both mechanically and chemically, enabling the capacitors manufactured with mica to exhibit similar properties. The material has a dielectric constant ranging from around 5 to 7. It is also found that the crystalline structure of mica has binding forces that are different in different planes. In one plane they are strong but weak in the perpendicular plane. This gives it a layered structure and enables it to be spilled along the lines of the weak bond into very thin flat sheets. 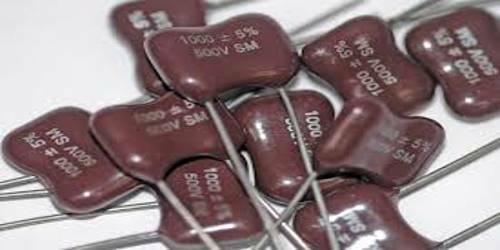 The sheets used in capacitor manufacture are from less than about 0.025 to 0.1 mm. Natural mica has to be carefully selected because some samples do contain impurities including, iron, sodium, ferric oxide, and lithium. This introduces some variability into any mica that might be used for capacitor manufacture and therefore it must be carefully inspected and classified. This is one of the reasons why silver mica capacitors are more expensive than other types which have the less manual intervention. Mica is chemically very stable and chemically inert. Mica does not react with oil, water, many acids alkalis, and solvents. As a result of this, aging does not occur to any major degree, and the variations of water vapor in the atmosphere do not cause undue variations in the overall capacitor performance.